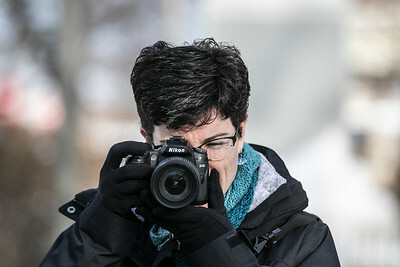 Sarah Nader- snader@shawmedia.com Sarah Wilson, pastor at St. John's Lutheran Church in Hebron poses for a portrait with her camera on the Woodstock Square Saturday, Dec. 10, 2016. Wilson, a hobby photographer, loves to take photographs and every Advent and Lent she challenges her congregation to also take photos. 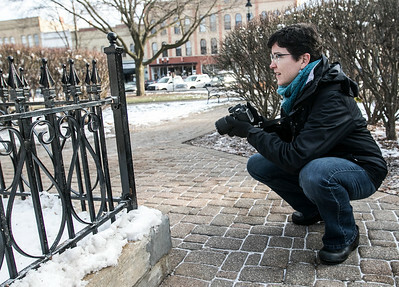 Sarah Nader- snader@shawmedia.com Sarah Wilson, pastor at St. John's Lutheran Church in Hebron lines up her photograph with her camera while taking pictures on the Woodstock Square Saturday, Dec. 10, 2016. Wilson, a hobby photographer, loves to take photographs and every Advent and Lent she challenges her congregation to also take photos. 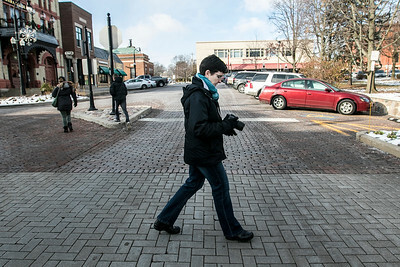 Sarah Nader- snader@shawmedia.com Sarah Wilson, pastor at St. John's Lutheran Church in Hebron walks around taking pictures on the Woodstock Square Saturday, Dec. 10, 2016. Wilson, a hobby photographer, loves to take photographs and every Advent and Lent she challenges her congregation to also take photos.